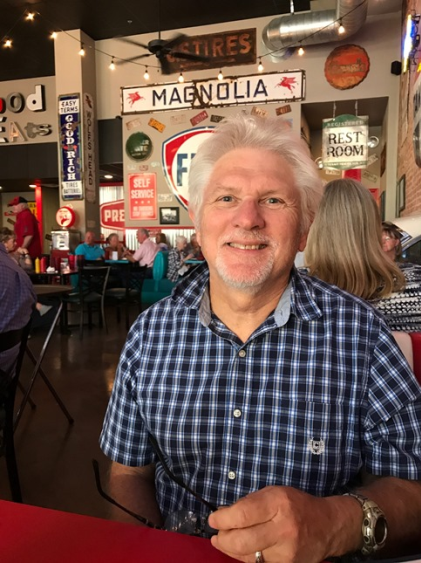 David Ouimette of FamilySearch is known to his colleagues as “the Indiana Jones of genealogy” because of his globe-trotting adventures in curating record treasures. He joins us to talk about the millions of records being digitized around the world right now. Lots of excited emails from you! Free update for RootsMagic 7 users: version 7.5.4.0 (update primarily fixes bugs). Click on the "Update Available" indicator in the lower right corner of your RootsMagic 7 program screen. If you don't already have RootsMagic 7, click here to see what’s new Or click here to order the upgrade. 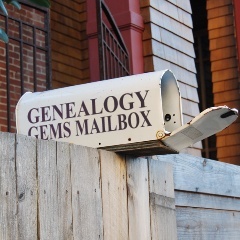 Click the red SUBSCRIBE button on the Genealogy Gems YouTube channel. Develop your search superpowers to uncover information about your family history on the web with Google at lightning speed! Explore tools like Image search, facial recognition, finding specific types of files, how to find the answers you need, and more. 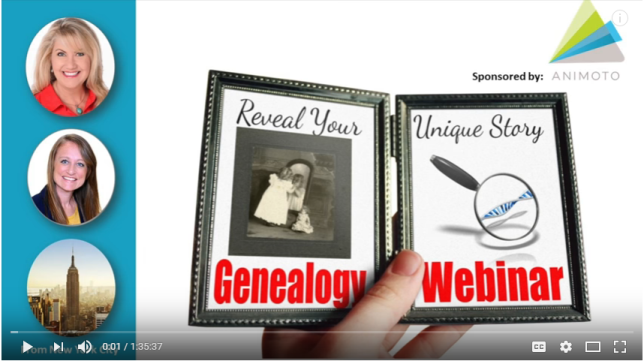 Click here to watch a class preview; click here to become a Genealogy Gems Premium member. 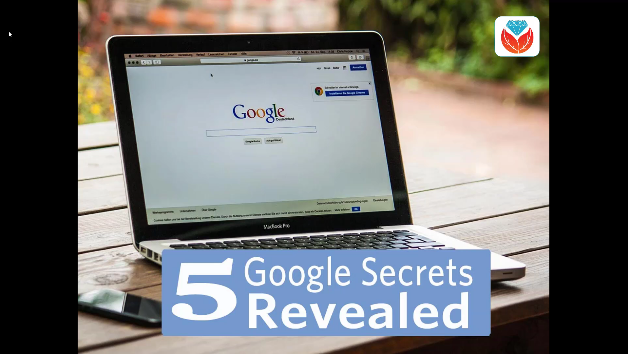 If you’re listening through the Genealogy Gems app, your bonus content for this episode is an easy-to-access version of the new Genealogy Gems Premium video, “Google Search Secrets.” The Genealogy Gems app is FREE in Google Play and is only $2.99 for Windows, iPhone and iPad users. 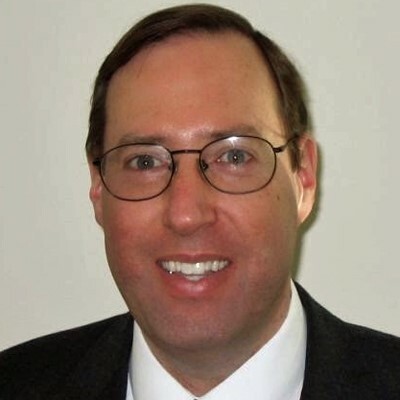 David Ouimette, CG, manages Content Strategy at FamilySearch. He has conducted research and analyzed archival materials in dozens of countries in North and South America, Europe, Africa, and Asia. David lectures regularly and has written for genealogists, including Finding Your Irish Ancestors: A Beginner’s Guide. 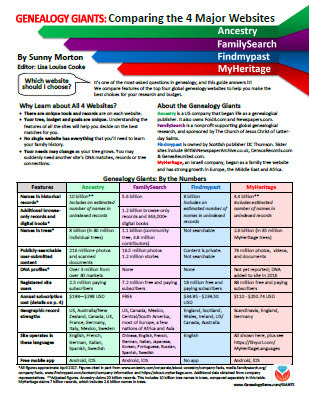 Genealogy Gems Contributing Editor Sunny Morton is the author of “Genealogy Giants: Comparing the 4 Major Websites.” Use this jammed-packed cheat sheet to quickly and easily compare the most important features of the four biggest international genealogy records membership websites: Ancestry.com, FamilySearch.org, Findmypast.com and MyHeritage.com. Consult it every time your research budget, needs or goals change! If a clue found in your ancestor’s US draft registration records listed military service you will want next to search for his Compiled Military Service Record (CMSR). The Compiled Military Service Records (often abbreviated at CMSR or CSR) record the name, unit, and period of service of the veteran along with information related to military service from the Revolutionary War to the end of the hostilities of the Philippine Insurrection after the turn of the 20th century. The information varies greatly from each of the war periods that recorded this information. 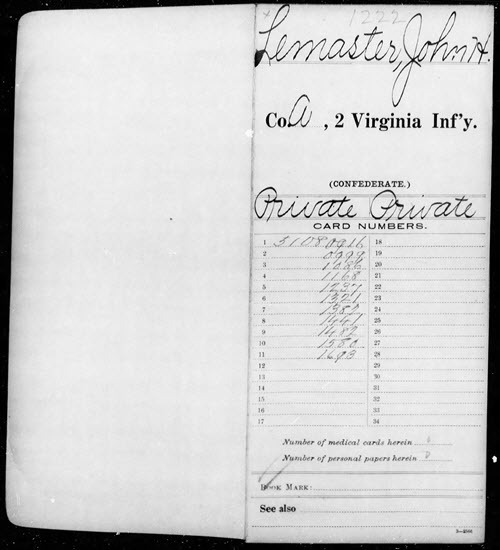 Besides the identifying features listed above, they typically contain muster in/out information, rank in/out details and further highlight the soldier career by recording promotions, prisoner of war memorandums, casualties, and a number of personnel papers which may include enlistment papers and other related documents. Several of the war periods also provide physical descriptions of the soldiers including; name, age, nativity, occupation, height, hair, eyes, and complexion information. This set of records represents the volunteer Army and doesn’t include regular Army enlistments. Except for limited records of the Revolutionary War and the War of 1812 for the Navy, the other branches of the military (including Navy, Marines, and Revenue Cutter Service) all have their equivalent set of records. 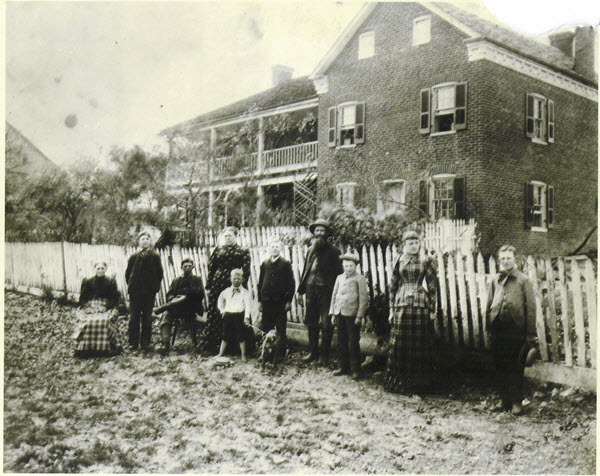 After the Confederate loss at the battle of Gettysburg he deserted and lived in Martinsburg in what was now West Virginia where on his Draft Registration he was listed as a deserter from the Rebel Army. 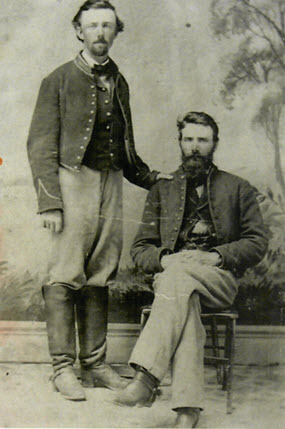 In 1864 he enlisted in the United States Army with the 3rd WV Cavalry, serving out the duration of the war until 1865. After the war he was granted a federal pension, with no mention of his former service in the Confederacy. 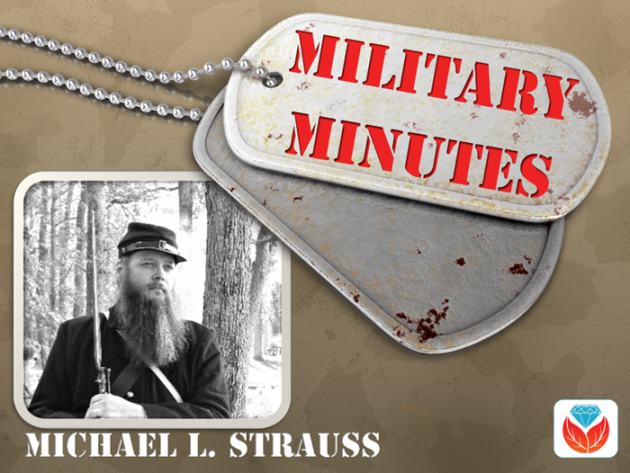 Shown on following pages: his military service records for both the Confederate and Union armies. Revolutionary War. Compiled Military Service Record images are online for CT, DE, GA, MD, MA, NH, NJ, NY, NC, PA, RI, SC, VT, VA, and Continental Troops. Genealogists should also search the local state where their ancestors were from as some Militia isn’t included in these records. During the Revolutionary War additional Compiled Service Records were completed for the Navy, which was broken down to include Naval Personnel, Quartermaster General, and Commissary General Departments. Old Wars (1784-1811). After the Revolutionary War, the newly formed United States government sought to maintain a regular Army. However, volunteer soldiers who served from 1784-1811 were recorded. (One of the reasons for volunteers to be called up would have included the Whiskey Rebellion of 1793.) Their Compiled Military Service Record full images are available online here. War of 1812. Compiled Military Service Records Indexes are online for CT, DE, DC, GA, IL, IN, KY, LA, MD, MA, MI, MS, MO, NH, NJ, NY, NC, OH, PA, RI, SC, TN, VT, VA and also the Cherokee, Chickasaw, Choctaw, Creek, and Shawanoe Indians along with United States Volunteers. Full copies of CMSR are online for the Chickasaw and Creek Indians, along with the men from Lake Erie and Mississippi. Indian Wars. Compiled Military Service Records Indexes are online for the various Indians wars from 1815-1858. Mexican War. Compiled Military Service Record indexes are online for AL, AR, CA, FL, GA, IL, IN, IA, KY, LA, MD, DC, MA, MI, MS, MO, NJ, NY, NC, OH, PA, SC, TN, TX, VA, WI, and the Mormon Battalion and the United States Volunteers. Full copies of the CMSR are online for AR, MS, PA, TN, TX, and the Mormon Battalion. 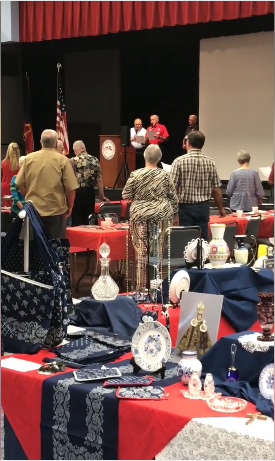 Union: Indexes are online for AZ, CA, CO, CT, IL, IN, IA, KS, ME, MA, MI, MN, MO, NH, NJ, NY, OH, PA, RI, VT, WA, WI, United States Veteran Volunteers, and Veteran Reserve Corps. Full copies of CMSR for AL, AR, CA, CO, Dakota Territory, DE, DC, FL, GA, KY, LA, MD, MA, MS, MO, NE, NV, NM, NC, OR, TN, TX, UT, VT, VA, WV, United States Colored Troops, United States Volunteers, and 1st NY Engineers. 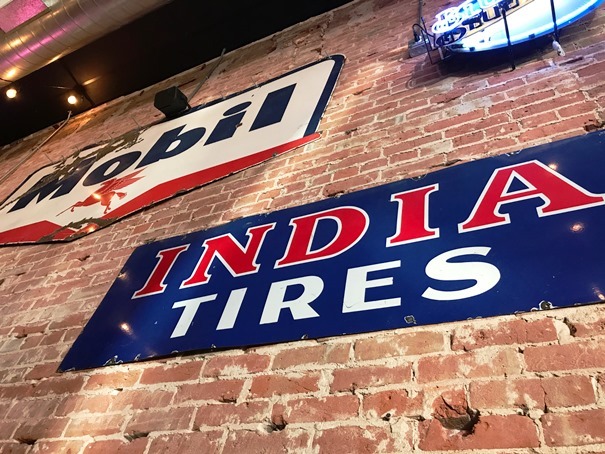 Confederate: indexes are online for AL, and VA. Full copies of CMSR are online for AL, AZ, AK, FL, GA, KY, LA, MD, MO, MS, NC, SC, TN, TX, VA, Miscellaneous, Volunteers, Indians, and Officers. Spanish American War. Compiled Military Service Record Indexes are online for AL, AR, CA, CO, CT, Dakota Territory, DE, DC, FL, GA, ID, IL, IN, IA, KS, KY, LA, ME, MD, MA, MI, MN, MS, MO, MT, NE, NV, NH, NJ, NY, NC, ND, OH, OK, OR, PA, PR, RI, SC, SD, TN, TX, UT, VT, VA, WA, WV, WI, WY, and United States Volunteers. Full copies of CMSR are online for FL. Old Wars. This database is an index and full images of the Compiled Military Service Records of those men who served after the Revolutionary War and before the War of 1812, covering the years of 1784-1811. Confederate: Compiled Military Service Records are searchable, with a link to Fold3 to view original images here. 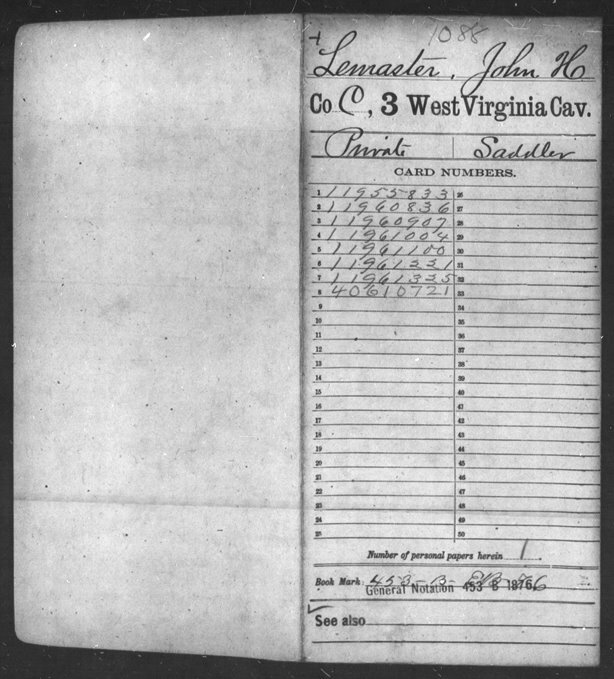 An additional set of Service Records comes from units that were raised by the Confederate Government and not from any of the states that comprised the Confederacy. The CMSR are available online to view the images and searchable by military unit here. Spanish American War. Compiled Military Service Record Indexes are online that cover the same geographical areas as on Fold3 here. 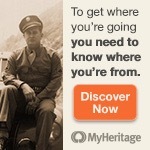 Full copies of CMSR are online on Ancestry for Florida here. Family Search has fewer Compiled Military Service Records available online that include images. One of the major collections includes the Revolutionary War CMSR’s that when searched here, the images provide a direct link to Fold3. Most of the other major war periods are microfilmed and available through the Family History Library in Salt Lake City, Utah. With online access through both Fold3 and Ancestry provided on the computers in the library, accessing the film is less desirable. Lisa’s tip: In the timeline you can specify a date, like 1860 (date and month too! ), then press play and it will play back and reveal the locations on mentions of your search query coming forward in time. It would be really interesting to take a word or phrase and see when it first occurred. This is a very feature-rich website! 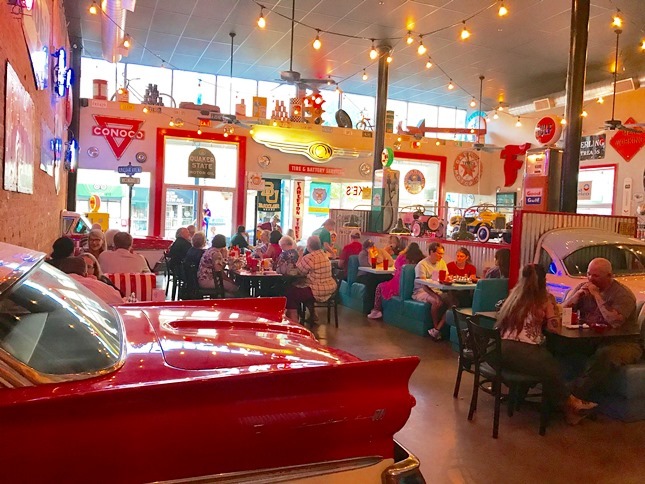 A short YouTube video documentary on Leavittown: it’s a great example of the do-it-yourself video narratives you can make to tell your own family’s stories! 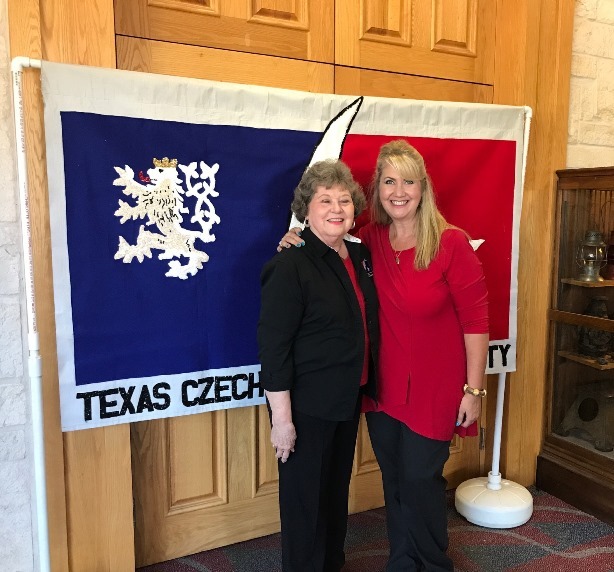 Listen to the Genealogy Gems Podcast twice a month! 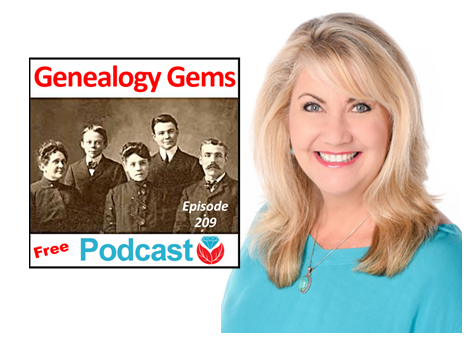 Check in on or after October 26, 2017 for Genealogy Gems Podcast Episode 210. What’s coming? Paul Woodbury of Legacy Tree Genealogists will share some great tips for beginning Swedish genealogy—and much more!